Concussion is a hot topic these days in sports, both professional and youth. In the last several years, we have learned so much about concussions that we didn’t know before and that knowledge has brought to light some pretty scary after effects. Concussions and head injuries are taken much more seriously than they have been in the past…and for very good reason. But what exactly is a concussion? Most people think that you only get a concussion if you hit your head on something or get hit on the head with something. That is simply not true. Your head does not need to come in contact with anything to get a concussion. You could be in a bad car accident that whips your head and neck around and get a concussion…even if your head doesn’t contact anything in the car. Why? When your head is whipped around, your brain moves within your skull and slams up against the bone causing injury and damage. That damage to the brain tissue is the concussion. 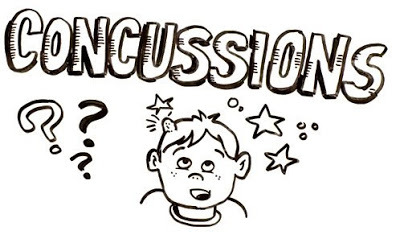 Concussions are diagnosed based on signs and symptoms present after the incident. In fact, they are very rarely seen on advanced imaging like a CT scan or an MRI. 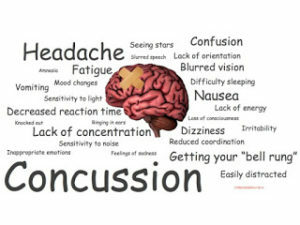 Common signs of a concussion include an inability to recall events before or after the hit or fall, dazed appearance or blank stare, confusion, lack of balance or coordination, slowed response to questions, changes in personality, mood or behavior, and loss of consciousness. Symptoms that are commonly reported include a headache or “pressure” in the head, nausea and/or vomiting, dizziness or blurred vision, sensitivity to light and/or sound, feeling groggy or fuzzy, altered concentration, and emotional changes such as “feeling down.” If you, or someone around you, experience a fall or strikes their head on anything and exhibits these signs and symptoms, they most likely have a concussion and should seek medical attention immediately. Signs and symptoms are usually noticed within a few minutes of the incident, but some may take a few hours or even days to manifest. It is important to monitor anyone who is suspected of having a concussion. Did you know that sports chiropractors can evaluate and diagnose concussions? Here at Pro Chiropractic, all four of our chiropractors are well versed in using the SCAT3, or Sports Concussion Assessment Tool. The SCAT3 is an assessment tool combining subjective complaints (how the person suspected of having a concussion feels) with cognitive functionality and balance and coordination observation by a physician. 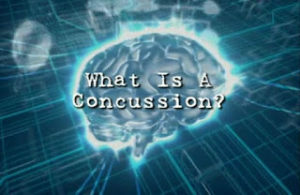 Once the assessment is complete, the physician can grade the results to determine first, if the person is concussed, and second, if they are, how severe the injury is. Once that has been determined, the physician will instruct on what restrictions are necessary to ensure proper recovery. Usually, the first step in recovery is a complete physical and cognitive rest. This means no physical activities, no school or work, no television, no cell phone, no video games, no music…basically just resting in a dark, quiet room for a day or so. The SCAT3 can be repeated as often as every 24 hours to reassess the state of the concussion. If the results of the following assessments improve, the restrictions will be lifted one by one until the assessment reveals full recovery from the concussion. If the concussed is an athlete who was injured during a sporting event or practice, they must follow this return protocol in order to be cleared. First, they must return to school without symptoms returning. Then, they can begin light aerobic activity, followed by moderate activity, then heavy activity with no contact, then practice and full contact, and finally return to competition. Post-concussion syndrome occurs when symptoms from the concussion last for weeks or even months without going away. 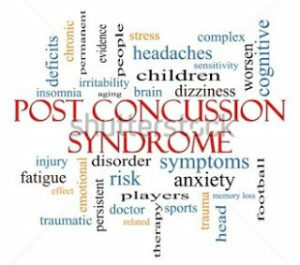 It is believed that symptoms of post-concussion syndrome are a result of structural damage to the brain or disruption of the neurotransmitter systems caused by the impact that triggered the concussion, thus requiring more time for the brain to heal and the symptoms to subside. There are risk factors for developing post-concussion syndrome such as age, gender, and cause of concussion. As we age, the brain becomes less resilient. “Studies have found increasing age to be a risk factor for post-concussion syndrome.” (http://www.mayoclinic.org/diseases-conditions/post-concussion-syndrome/basics/risk-factors/con-20032705) It is also more likely that women are diagnosed, but that may be because woman, statistically, are more likely to seek medical care. Finally, the way you got the concussion in the first place may play a role in whether or not you get post-concussion syndrome. Those with more traumatic causes such as car accidents, physical assault, falls, or contact sports are more prone to developing post-concussion syndrome. If you suspect that you may have gotten a concussion, were never initially treated, and have lingering symptoms such as headaches and dizziness, seek medical attention immediately. If you or a loved one plays sports, make sure that you are educated on the signs and symptoms of concussion. And if you notice these symptoms, seek medical attention immediately! Pro Chiropractic has 3 state of the art locations in the Gallatin Valley and 4 amazing chiropractors trained to assess and treat anyone who has recently suffered a concussion.